Vinyl Vixen, Proud Partner of Wrapsesh AZ. We are a dream-created wrap company, that specializes in custom and prioritizes quality. Cars are the canvas, a torch is our tool, and vinyl is our media. We excel in creating unique, rolling art with our vehicle wraps and creating a masterpiece meant to last. Our methods aren't conventional and we like to push the boundaries; but a flawless finish is our trusted result. Installers, creators, and operators of Wrapsesh consist of a powerhouse couple, Mike and Jess. Michael Shedd is a certified mechanic, with over 6 years in the vinyl industry and 10 years in the automotive field combined. Jessica Bonifacio, other co-founder, was mentored by Michael in an apprenticeship in 2015. By 2016, they started their company, Wrapsesh, and the "Vinyl Vixen" persona with it. Jess uses the Vinyl Vixen Wraps brand to promote a positive female presence within the vinyl industry, networking with girls around the world to create a united and stronger presence. Team Wrapsesh recently became self titled, "The Shark Mouth Squad" when they added two additional female installers to their team this year. Believing team work makes the dream work, this wrap couple boasts efficiency, a flawless finish, and a whole lot of whacky. Their newest endeavors this year began with launching the Wrapsesh Youtube Channel; featuring weekly videos consisting of tutorials, tips, tricks, and full builds. They share free advice and information both on and off screen with installers around the world to try and promote better quality wraps within the industry. They also just launched an apparel line August 2018, featuring new designs every month on hats, tees, and more. So what is in store for Slim and Vix next? Tools, travel, shows, and much more! We hope you enjoy our journey. The Vinyl Vixen networks with the very select few females across to world involved in the wrap or paint protection services industry. 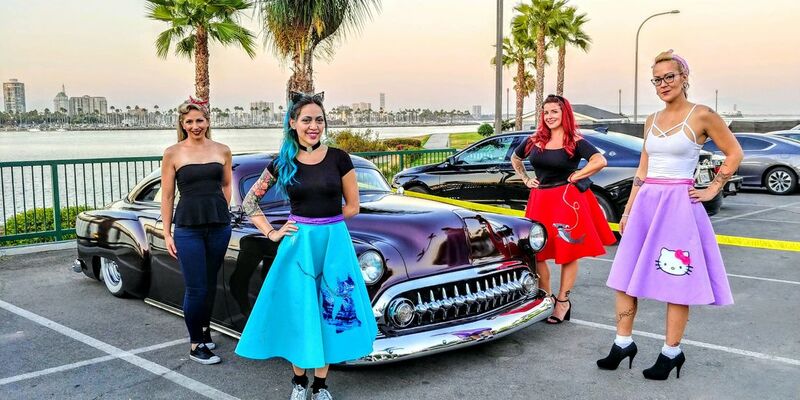 Our goal is not only to support other females currently working in the field, but to also inspire new girls to join the exciting and fun world of automotive restyling. We use several different female designers and printers across the nation and like to promote each other both on and offline. Our shop also sponsors several female racers, riders, and drivers locally along with creating jobs for females within our industry. We currently have 3 female installers and are always pushing for more!